STORM BREWING Shannon worries about wild weather — and who doesn’t these days? — in Nichols’ indie drama. Are we waiting for the end of the world, or what? Like Melancholia, writer-director Jeff Nichols’ Take Shelter takes apocalyptic terrors and puts them in intimate, indie-movie terms. The film will probably have vacated Vermont screens by the time you read this, or soon after. But, with its recent haul of Independent Spirit Award nominations, it won’t leave the public eye. Where von Trier’s film has stylistic brio and Euro glossiness, Nichols’ is a slow-burn character study set and shot in the American heartland. It plays like a drawn-out version of one of those classic “Twilight Zone” episodes with an unreliable focal character — one who might be a prophet, or just plain insane. 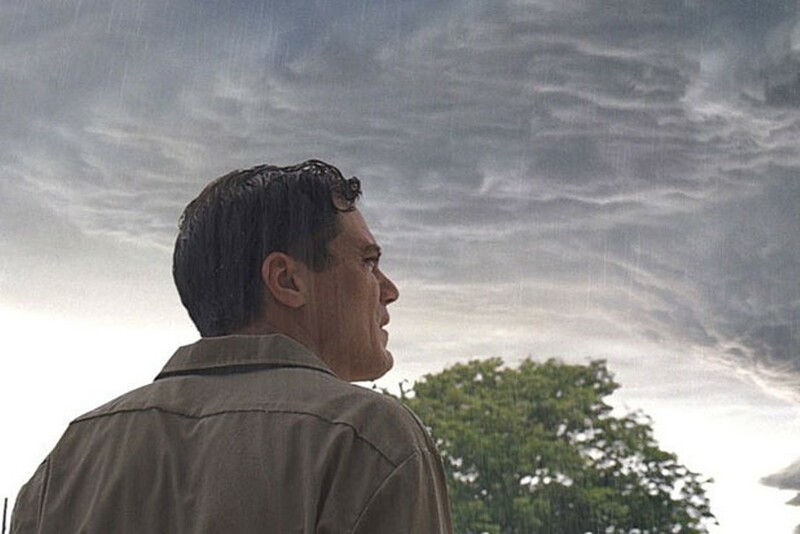 An Ohio construction worker and family man, Curtis (Michael Shannon), begins dreaming of a storm of biblical proportions that makes dark rain fall from the churning sky and turns people against their near and dear ones. It sounds like a prequel to “The Walking Dead” or a Stephen King flick, except that Curtis experiences his nightly terrors as continuous with his bland waking reality. So does the audience, and that continuity makes the dream sequences disturbing on a deeper level than anything in the horror genre. Being a methodical midwesterner, Curtis doesn’t overreact. He knows his mother (Kathy Baker) is a diagnosed schizophrenic, so he seeks psychiatric advice. At the same time, to cover all the bases, he beefs up his backyard tornado shelter and carefully distances himself from anyone who has attacked him in his dreams, such as his work partner (Shea Whigham). But what if those potential monsters turn out to include Curtis’ loving wife (Jessica Chastain), who tries hard to tolerate his behavior, and their young daughter (Tova Stewart)? How long can the family’s bonds — and its finances — accommodate his obsession? As the film progresses, it becomes clear that, in Nichols’ mind, the storm is already here. The script isn’t subtle about the real forces closing in on these ordinary folks: bank loans, medical bills, job insecurity, dread of the future. Whether Curtis’ fixation is a cause, a symptom or merely a distraction, it’s a topical conceit that could have been painfully ham-handed if embodied by a lesser performer. But Shannon, the lanky, antsy actor who also starred in Nichols’ Shotgun Stories, is nothing short of brilliant. In all but one scene, he keeps his performance quiet, letting the pinched tension in his face convey the character’s unraveling. Like his daughter, who is deaf (and tends to accompany him in his dreams), Curtis doesn’t have much use for words. Most of the communication falls to his wife, who is patient but no caricature of selfless devotion. Chastain matches Shannon with her fourth star-making performance this year. Overall, Take Shelter would have benefited from a tighter structure like those of the horror films it sometimes mirrors: Chilling parables are more chilling when they’re brief. Still, this is a showcase for two of the best actors of our time that resonates both figuratively and — when the thunder booms — literally.